Japan’s decluttering guru, Marie Kondo, has featured in the news heavily after her successful Netflix show ‘Tidying Up With Marie Kondo.’ She is a renowned professional organising consultant who is on a mission to spark more joy in our lives through the art of tidying up. Here are the 5 key lessons from her KonMari method to inspire you to live a bigger life with less. Get a free trial storing a small box for a month on us. Use promocode KONDOTRIAL at checkout. Good luck with your journey to a tidier, happier life. Marie Kondo suggests that we should step away from the method of tackling one room at a time. Instead, by focusing on decluttering through the different types of belongings. She recommends starting with clothes as they tend to be the least sentimental items we own so it’s an easier starting point! Once you have accumulated a big pile, assess item by item, and consider if it sparks any joy, e.g. the item could bring back a certain memory that radiates positivity. This thought process may seem a little unnatural at first but Kondo assures us it will come with ease later. Make piles of the stuff you really want to keep, things you want to gift to friends or charity, and things that can be stored outside of your home such as your winter clothes in the summer and vice versa. Hint: Under the bed or shoved in the back of your wardrobe doesn’t count! We are all guilty of shoving our belongings anywhere they’ll fit from time to time. Marie stresses the importance of stopping this and having a designated space for all of your possessions. They all deserve respect and space to breathe if they are to have any chance at giving us joy. By ensuring that there is a special place for everything you own, you will not end up purchasing more than you need. This is crucial to helping the decluttering process as it is easier to decide which items you can get rid of when they don’t have a designated space. You may have realised that we have repeated the word ‘Joy’ a lot here. One of the fundamental principles of Marie Kondo’s KonMari method is to surround yourself with items that give you this joy and improve your sense of happiness and well-being. It is important to acknowledge what your possessions do for you everyday, to practice gratitude for what we have and stop craving the material things we don’t need. By starting to thank your belongings for their service to you, it will become apparent which possessions you are more attached to than others. This will highlight which items you are happy to get rid of. When you do begin decluttering and get rid of some possessions, give them a final thank you and good bye. This may seem like a small thing, but the rewards are huge. Marie has designed the perfect way to fold your different garments, making it much easier to select them from your dresser. You can fit more clothes comfortably into the space that you have and the clothes are protected more from damage. There is a lot to be said for taking some stress away from the morning routine by being able to clearly identify which garment is which at a quick glance in your perfectly tidy wardrobe. 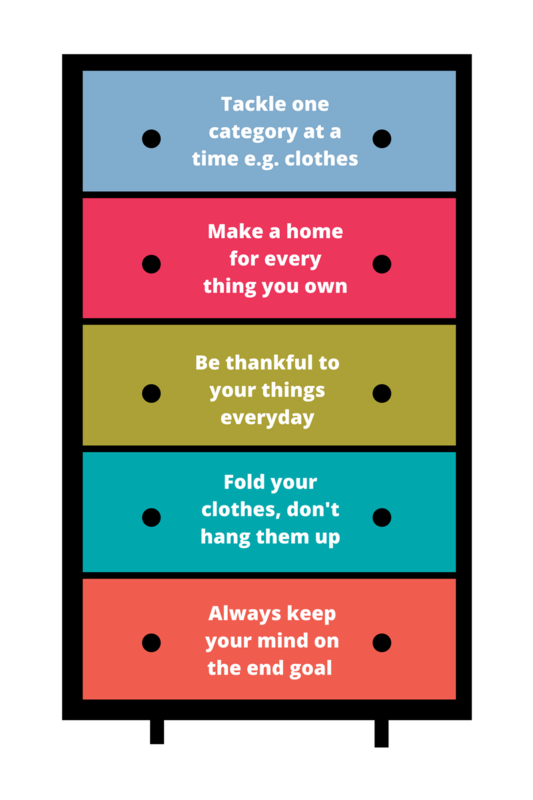 Check out Marie Kondo’s handy tutorial videos on how to fold flawlessly. Tidiness is a journey. There are always improvements that can be made. It is important that when you set out on this journey, sure you establish why you are doing it and what you want to gain. It may be that you want a clearer space at home to help with your creativity and serenity. If this is the case, remind yourself before every tidying task that this is helping you reach your goal. This way, you are less likely to give up. The more you start to see the benefits and understand your end goal in sight, the more fun the whole process will become. 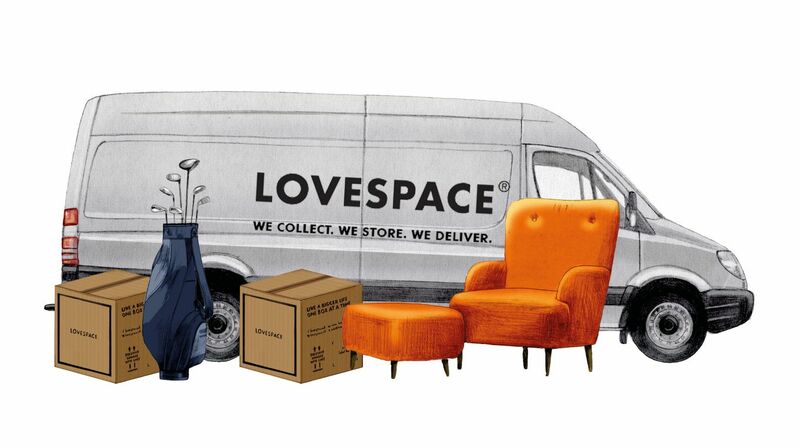 When clearing out your belongings, if you decide you have some things you don’t need in the house but don’t want to get rid of then please visit our storage page to get a quote and book online. We make it really convenient as we collect, we store and we deliver! Rachel Burditt, better known as Declutter Darling is considered the UK’s answer to Marie Kondo. Check out this post A Day In The Life Of A Professional Declutter for more information.